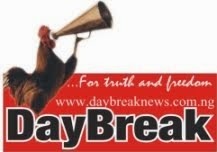 DAYBREAK NEWSPAPER : Al-Mustapha storms Makurdi, visits Paul Unongo. The former controller of prison said the purpose Al Mustapha’s visit to the state was to thank the people of the state for saving his life. As soon as Mustapha arrived Makurdi, he was driven straight to the residence of his host, where he echoed ‘I thank you my brother, I thank you for my life, I appreciate you’ even as he hugged the relatives and friends of the host who were introduced to him. 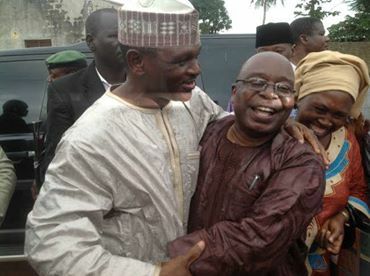 The visitors who came in a long convoy with tight security spent only ten minutes in his house and told Mustapha that they should proceed to Jato-Aka in Kwande local government area of the state where they were to meet the former Minister for Steel during Shagari regime, Wantaregh Paul Unongo. Mr. Ihagh however denied any political undertone to the visit to Unongo, saying, ‘he is our leader in Tivland and I told him that we should pay him homage in his country home about four hours drive to the capital city. However, all efforts to speak with Al Mustapha were rebuff turned down as he was only smiling to the newsmen who approached for a brief interview until they drove away to Jato-Aka. Major Al Mustapha was recently released from prison by the Court of Appeal after spending 15 years over his alleged involvement in the death of Alhaja Kudirat Abiola, wife of late business Mongol and acclaimed winner of June 12, 1993 general elections, Chief Moshood Abiola. (Additional report: Courtesy of Ati Tekula).